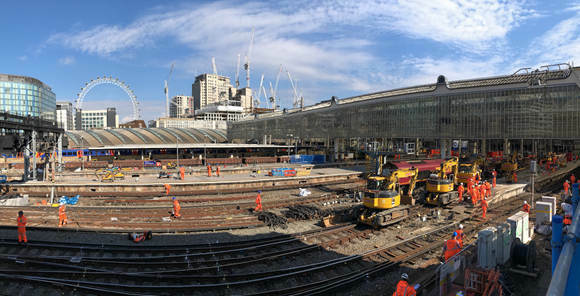 Updated: The Government has announced a direct grant to Network Rail of up to £34.7bn between 2019 and 2024, which it says will allow the infrastructure operator to spend nearly £48bn once its expected income is included. The Government will give Network Rail a funding boost from 2019, according to reports, despite the rail regulator suggesting it has become less efficient, with nearly £4bn worth of improvements being deferred for lack of cash. The Guardian reports that, following 'complex negotiations' with the Treasury, Network Rail is likely to receive over £40bn for Control Period 6 (CP6) from 2019 to 2024, compared with its current five-year budget of £38.5bn for CP5. The paper states that this cash is likely to include financing for some projects that have lapsed during CP5 but not major rail enhancements, with additional financing for schemes such as the TransPennine route upgrade expected to be announced separately early next year. Both Network rail and regulator the Office and Rail and Road (ORR) declined to comment on the report. Transport Network has also contacted the Department for Transport for comment. It comes as the ORR published its latest Annual efficiency and finance assessment of Network Rail, which discloses that the backlog of work is increasing at the infrastructure operator. Network Rail ‘currently forecasts that by the end of CP5 £3.9bn of renewals work will be deferred to a later date’ and this ‘may affect the sustainability of the network and increase costs, in the medium and longer term’, the ORR reports. The ORR also said that the efficiency of Network Rail’s core business activities has declined by 4.4% over the first three years of CP5, compared with the ORR’s assumption of a 13.7% improvement. The ORR adds that Network Rail’s net debt increased by £4.6bn to £44.8bn in 2016-17. It states that a number of issues are likely to put pressure on Network Rail’s financial ‘headroom’ of £0.3bn and that it ‘needs to further develop its contingency plans to address these pressures’. A spokesperson for the infrastructure operator said: ‘Network Rail continues to invest heavily in Britain's railways and we take our financial responsibilities seriously. Budgets are under constant review to ensure we maximise the value from every pound spent.